Located in a large double hangar at Ona Airpark between Huntington and Charleston, Carbon Fiber Composites (CFC) continues to grow as a manufacturer of high-quality composite airframe parts for the kit aircraft industry. Kit aircraft are part of the experimental aircraft industry and according to the Experimental Aircraft Association (EAA), experimental aircraft registrations outnumber factory-built aircraft five to one. While innovation and the ability to fill a market need have led to the company’s success, owner Brian Alley also credits the technical assistance received through TechConnect West Virginia’s StartUp Manufacturing Program for helping the company expand its expertise and product offerings. In 2012, CFC was one of the first companies to receive assistance through TechConnect’s StartUp Manufacturing Program. Grant funding provided by the U.S. EDA and the State of West Virginia to TechConnect allowed CFC to use the facilities at the Robert C. Byrd Institute for Advanced Flexible Manufacturing (RCBI) to produce high-quality composite airframe parts for use in their kit aircraft products. The company uses vacuum resin infusion and epoxy resin as its method of choice in manufacturing aerospace grade composite structures. This method has proven to be very cost-effective for the firm’s clients, which include both kit airplanes and helicopters. The assistance offered by TechConnect allowed CFC to work with Richard Hogan Designs on a prototype aircraft called “The Innovator”. The work included the development of all tooling and parts production. Since then, CFC has landed additional kit aircraft work with Safari Helicopter, Ion Aircraft, Fast Little Airplanes and Samson Motorworks. 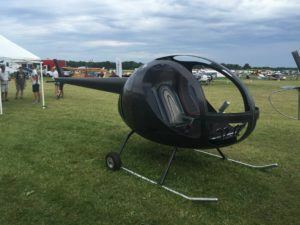 Working at RCBI Bridgeport, Alley fabricated the molds and produced the parts for Safari Helicopter’s new helicopter prototype, all in less than 7 months. This included the master patterns, called plugs, composite tooling or molds, and all of the carbon fiber airframe components. Safari has produced more than 1000 kits for helicopters, but until now, all were metal. Alley is doing the first kit in carbon fiber, and hopes to see the new prototype fly by the end of the year. Then he will get the parts production contract moving forward. For Samson Motorworks, Alley will make several molds for a kit aircraft called “The Switchblade”. More recently, CFC received the molds of another kit aircraft produced by a company that is no longer manufacturing them. Alley plans to reintroduce the product using mostly carbon fiber composites, as opposed to the original fiberglass. Fast Little Airplanes, a Charlotte, NC based firm, will collaborate on the project. 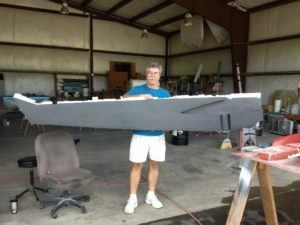 To learn more about Carbon Fiber Composites, visit their website at www.carbonfiberwv.com.